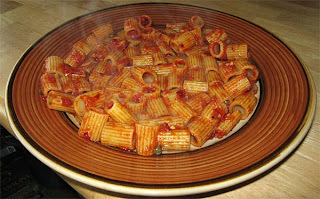 The following photo probably looks like every other tomato-based pasta dish. But this sauce is serious. In addition, it's probably better than any puttanesca in your local Italian joint, and definitely better than what comes out of the can. Nuts and bolts of it (no exact measurements really): olive oil and anchovy fillets go in a skillet, heat medium-low. As the anchovies soften, mash them into a paste. Add garlic and cook it until light gold, do not brown it. Add tomatoes, capers, black pepper, red pepper flakes, and rosemary. Mix well and cook at a very lazy simmer for 20 minutes or so. Before combining with your favorite pasta (spaghetti is traditional here), add lemon juice. It's important to add the lemon juice at the end or the lemon flavor cooks out and only the acidity remains.